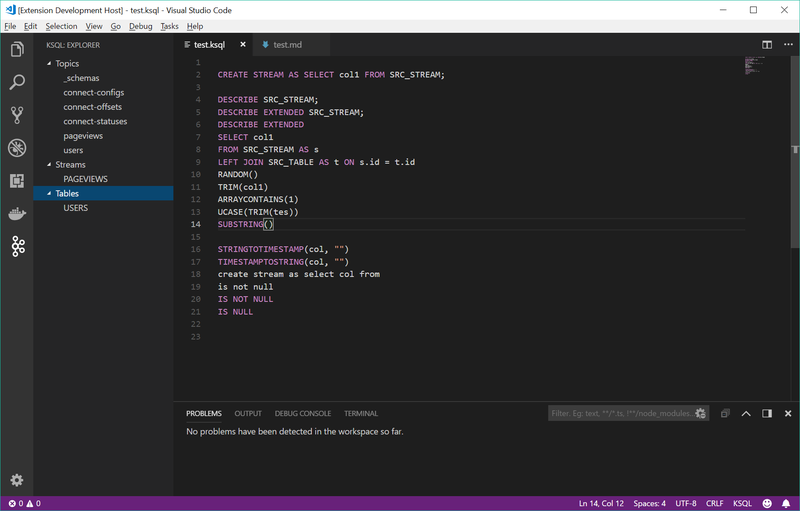 Visual Studio Code>Programming Languages>KSQLNew to Visual Studio Code? Get it now. This provides language support for KSQL - the streaming SQL engine for Apache Kafka. You can also download the vsix file from the Marketplace directly to install it locally. Any file with the extension .ksql will be automagically detected. by going to the command palette (Shift-Cmd-P on the Mac) and entering 'Change Language Mode' (or a subset of it; it will auto-complete), select the match, and then type KSQL. When you install the extension you get a Kafka icon in the activity bar, and you can see the topics, streams and tables in your connected instance. You can refresh the Explorer with Ctrl+Shift+P and choose the Refresh KSQL Explorer command. 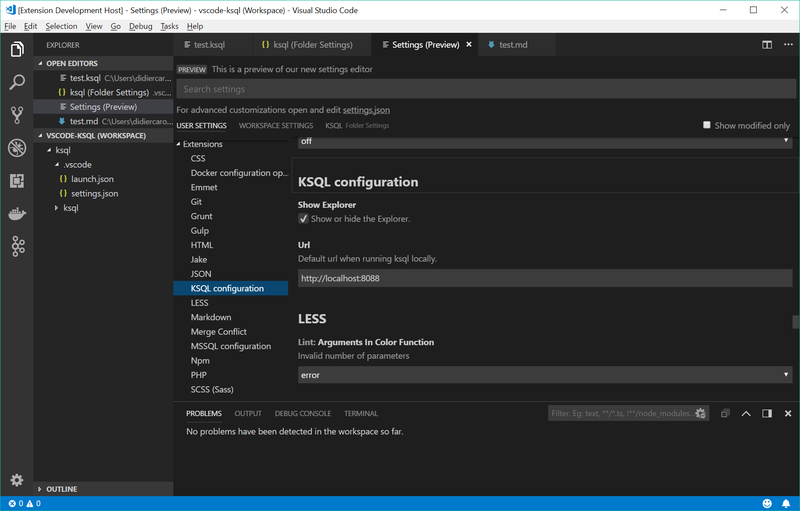 The extension assumes that your KSQL server is at localhost:8088. If it is not change the endpoint URL in the workspace config. Press F5 to open a new window with this extension loaded. open a file with the .ksql extension in the newly openened window. Set breakpoints in the code inside src/KSQLMain.ts to debug the extension. Find output from the extension in the debug console of the initial window.